GOVERNOR Nyesom Wike is gradually coasting to widely anticipated second term victory as the Independent National Electoral Commission, INEC, resumed results collation on the Rivers state governorship and state assemblies elections it suspended earlier. 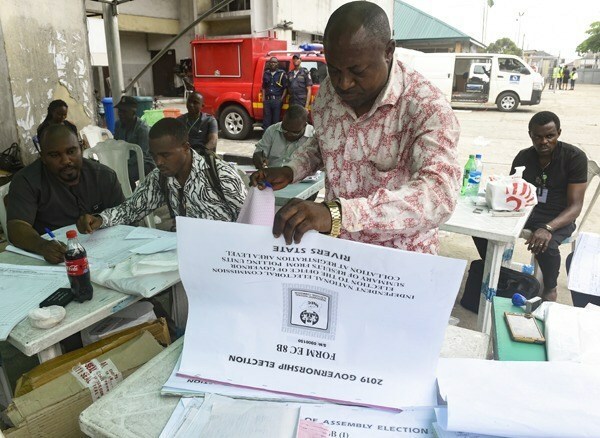 An electoral official looks at documents at the state headquarters of the Independent National Electoral Commission (INEC) in Port Harcourt, Rivers State, on March 10, 2019. – Nigeria’s election authorities announced the suspension of activities in volatile opposition-held Rivers State on March 10 citing violence and threats to its staff, as tensions rise in the wake of closely-watched regional elections. Counting is continuing across the country after the March 9 elections for governors in 29 of Nigeria’s 36 states, all state assemblies and administrative councils in the Federal Capital Territory of Abuja. Results are expected in the coming days. (Photo AFP) At the end of yesterday’s proceedings on the collation of the results, Wike of the Peoples Democratic Party, PDP, won in 13 of a total 15 Local Government Areas,LGA, so far presented among the 17 LGAs results INEC said it had received before it suspended the exercise March 10. The cumulative standings among the parties placed Wike in pole position with 426, 279 votes against closest contenting All Progressives Congress, APC, backed candidate of the African Action Congress, AAC, Biokpomabo Awara who is trailing with 129,855 votes. Aside beating Transport Minister and arch political rival, Rotimi Amaechi to results from the former governor’s home Ikwerre LGA, Wike also won in Port Harcourt City, Andoni, Eleme, Opobo/Nkoro, Bonny, Okrika, Omuma, Ogba/Egbema/Ndoni, Etche, Emohua, Ahoada East, and Tai LGAs while Awara took Oyigbo and Akuku Toru LGAs. The biggest winning margin between the two so far was reflected in the results from Andoni where Wike polled 92, 056 votes against Awara’s 5335, the cumulative collated figures so far leaving Wike with a 296,424 winning margin against Awara. Meanwhile, PDP’s Sen George Sekibo snatched Rivers East Senatorial seat as collated, just as Betty Apiafi also of PDP won the Rivers West Senate seat, for a clean sweep for the party in the senatorial elections as Barry Mpigi was first to clinch the first 2019 Rivers senate elections for South East District. In most of the results presents by the LGAs Collation Officers, votes in several units and wards were cancelled due to reported violence and disruptions on the process. Collation continues tomorrow with results for the two last LGAs already secured by INEC including densely populated Wike’s home locality of Obia Akpor where he’s expected to increase his lead substantially. Proceedings yesterday were coordinated by State Collation Officer, Teddy Adias and national commissioner in charge Rivers, Bayelsa and Edo states, May Agbamuche-Mbu who set 11 ground rules for stakeholders before collation started. INEC resumed the stalemated Rivers governorship andstate assembly elections yesterday amidst protest by pro AAC’s demonstrators led by Chief Anabs Sara-Igbe in major Port Harcourt streets for hours before armed thugs dispersed the crowd with sporadic shooting. The tense protest atmosphere, added to security operatives shutting of the INEC Office’s end of Aba Road to traffic largely unsettled traffic and panic stricken residents in the Rivers capital yesterday. GOVERNOR Nyesom Wike is gradually coasting to widely anticipated second term victory as the Independent National Electoral Commission, INEC, resumed results collation on the Rivers state governorship and state assemblies elections it suspended earlier. An electoral official looks at documents at the state headquarters of the Independent National Electoral Commission (INEC) in Port Harcourt, Rivers State, on March 10, 2019. – Nigeria’s election authorities announced the suspension of activities in volatile opposition-held Rivers State on March 10 citing violence and threats to its staff, as tensions rise in the wake of closely-watched regional elections. Counting is continuing across the country after the March 9 elections for governors in 29 of Nigeria’s 36 states, all state assemblies and administrative councils in the Federal Capital Territory of Abuja. Results are expected in the coming days. (Photo AFP) At the end of yesterday’s proceedings on the collation of the results, Wike of the Peoples Democratic Party, PDP, won in 13 of a total 15 Local Government Areas,LGA, so far presented among the 17 LGAs results INEC said it had received before it suspended the exercise March 10. The cumulative standings among the parties placed Wike in pole position with 426, 279 votes against closest contenting All Progressives Congress, APC, backed candidate of the African Action Congress, AAC, Biokpomabo Awara who is trailing with 129,855 votes. Aside beating Transport Minister and arch political rival, Rotimi Amaechi to results from the former governor’s home Ikwerre LGA, Wike also won in Port Harcourt City, Andoni, Eleme, Opobo/Nkoro, Bonny, Okrika, Omuma, Ogba/Egbema/Ndoni, Etche, Emohua, Ahoada East, and Tai LGAs while Awara took Oyigbo and Akuku Toru LGAs. The biggest winning margin between the two so far was reflected in the results from Andoni where Wike polled 92, 056 votes against Awara’s 5335, the cumulative collated figures so far leaving Wike with a 296,424 winning margin against Awara. Meanwhile, PDP’s Sen George Sekibo snatched Rivers East Senatorial seat as collated, just as Betty Apiafi also of PDP won the Rivers West Senate seat, for a clean sweep for the party in the senatorial elections as Barry Mpigi was first to clinch the first 2019 Rivers senate elections for South East District. In most of the results presents by the LGAs Collation Officers, votes in several units and wards were cancelled due to reported violence and disruptions on the process. Collation continues tomorrow with results for the two last LGAs already secured by INEC including densely populated Wike’s home locality of Obia Akpor where he’s expected to increase his lead substantially. Proceedings yesterday were coordinated by State Collation Officer, Teddy Adias and national commissioner in charge Rivers, Bayelsa and Edo states, May Agbamuche-Mbu who set 11 ground rules for stakeholders before collation started. INEC resumed the stalemated Rivers governorship andstate assembly elections yesterday amidst protest by pro AAC’s demonstrators led by Chief Anabs Sara-Igbe in major Port Harcourt streets for hours before armed thugs dispersed the crowd with sporadic shooting. The tense protest atmosphere, added to security operatives shutting of the INEC Office’s end of Aba Road to traffic largely unsettled traffic and panic stricken residents in the Rivers capital yesterday.